When you read this article's title, I doubt you immediately thought it would be about a vacuum tube circuit, or even one that uses discrete transistors to implement the circuit. Rather you most likely though it would be about an integrated circuit (IC). Operational amplifiers (opamp) are building blocks characterized (ideally) by their infinite input impedance, zero output impedance, infinite open-loop bandwidth and gain, zero input offset voltage, amongst other defined parameters. The first commercially produced integrated circuit (IC) opamp came to market in 1964 via Fairchild Semiconductor (the µA702, brainchild of Bob Widlar). That was the year after this article was printed, and it's interesting to note that the schematic symbol had already been established prior to IC versions. Vacuum tube opamps were common in control systems for radar antenna controls and big guns on ships in World War II. Part 1 / These circuits are widely employed in industrial test equipment and analog computers. Theory of amplifier along with design and construction of a unit are covered. Fig. 1. (A) Typical use for operational amplifier. (B) An audio phase inverter with a gain of 10. (C) Method of using operational amplifiers as an extremely well-regulated supply. 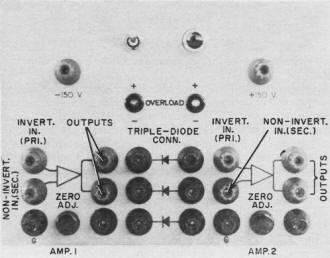 The operational amplifier was originally invented to perform precise mathematical operations in electronic analog computers. Yet some of its most fascinating uses are in other than computing applications. How would you like one device that could be used, simply by connecting a few external parts, as an amplifier, an oscillator, a voltmeter calibrator, a regulated power supply, a precision oscilloscope sweep generator, a capacitance bridge, and even as an analog computer. This is the operational amplifier. Its uses are literally unlimited. The sheer act of building and using operational amplifiers could no doubt cause the reader to discover some new applications. This article will acquaint the reader with the operational amplifier, show the design and construction of a two-amplifier unit, and describe in detail several representative uses of same. Just what is the operational amplifier? How is it different from any other amplifier? First of all, it is a feedback amplifier for which the user supplies the feedback components. 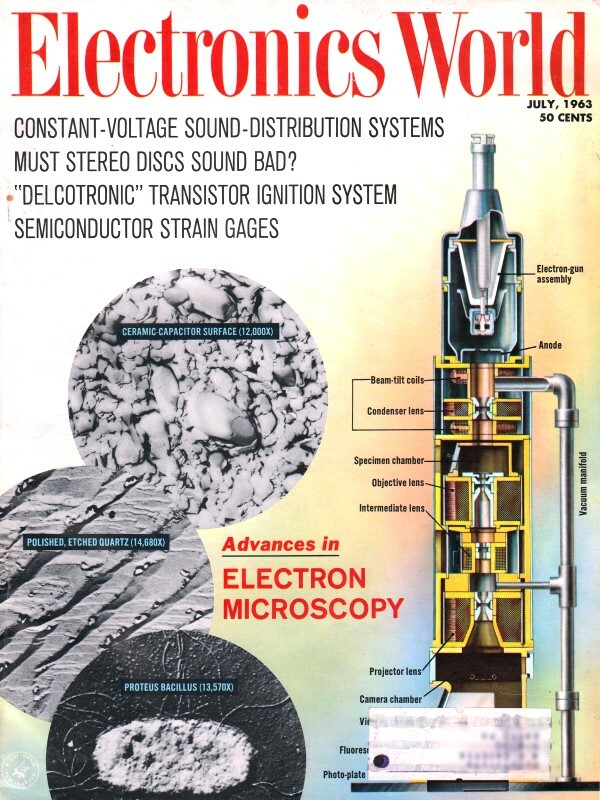 These components, incidentally, may be resistive, reactive, or non-linear. It is capable of any amount of feedback. One usage that will be described later involves reducing the amplifier open-loop gain (gain without feedback) from several million to a gain of 1/10 by means of feedback. An ordinary audio amplifier would break into oscillation or motorboating if this were tried. Such operation is possible with an operational amplifier because of two of its characteristics. It is direct coupled (this makes motorboating impossible), and its gain is rolled off to less than unity before the necessary phase shift to sustain oscillations takes place. Second, its characteristics are determined to the greatest degree possible by the feedback components. If you have ever tried to calculate feedback components for an ordinary amplifier you will know that amplifier gain, output impedance, and various stability criteria enter into the calculations. For the operational amplifier the calculations simply involve the ratio two external impedances. Basically, the operational amplifier is a direct-coupled amplifier, and with the input grounded the output is at zero volts d.c. in respect to ground. Its gain is exceedingly high, 1000 to 15,000 being typical for simple devices and gains to one billion being found in laboratory units. Its output impedance is quite low by nature and, with feedback, it is further reduced to where it becomes negligible. Fig. 2. 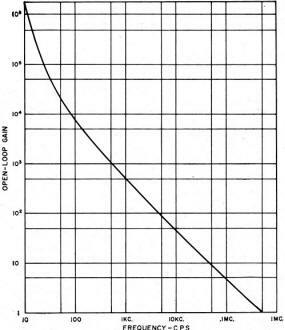 Plot of amplifier gain vs frequency is close to ideal. A typical application is that of Fig. 1A. An amplifier with a gain of -10,000 is shown for illustration, the minus sign denoting a phase inversion between the input, point A, and the output, point C. The external feedback components are resistors Rin and Rf. With the +1-volt battery connected to the input, the output will start to go highly negative. This output will be fed back to the summing junction, point B, in a degenerative manner, tending to prevent the output from going negative. The circuit will reach a state of equilibrium with the output at about -100 volts, which is -100 times the input voltage, or equal to the ratio -Rf/Rin. It can be shown that if the amplifier open-loop gain were infinite the system gain would simply be -Rf/Rin. And it can also be shown that if the amplifier gain were only (-Rf/Rin) x 100, the system gain would be within one per-cent of the ratio -Rf/Rin. Similarly, if the output impedance of the amplifier without feedback were about 500 ohms and the gain reduced by a factor of 100 by feedback, the output impedance would also be reduced by more than a factor of 100, to less than five ohms. By the same token, amplifier noise and distortion are reduced by similar amounts. Another point to remember about the operational amplifier is the nature of the summing junction, point B of Fig. 1A. With +1 volt at the input, point A, and -100 volts at the output, the voltage at the summing junction will be -1001/-10,000 or 0.01 volt. This point behaves as a very low resistance to ground, and since it does so we can define the input impedance to the system as simply the value of Rin, or 10,000 ohms in Fig. 1A. Figs. 1B and 1C are very practical applications of the above principles and both are possible with the unit to be described. Fig. 1B is an audio phase inverter with a gain of 10. 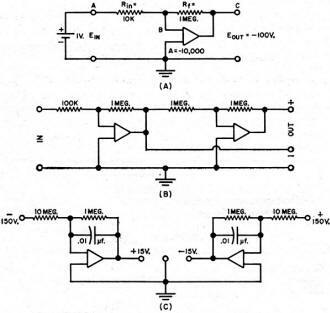 The first amplifier provides a gain of 10 and furnishes the negative or inverted output. It also drives the second amplifier which is connected as a unity-gain inverter. This amplifier re-inverts the first amplifier's output to provide a positive or non-inverted output. 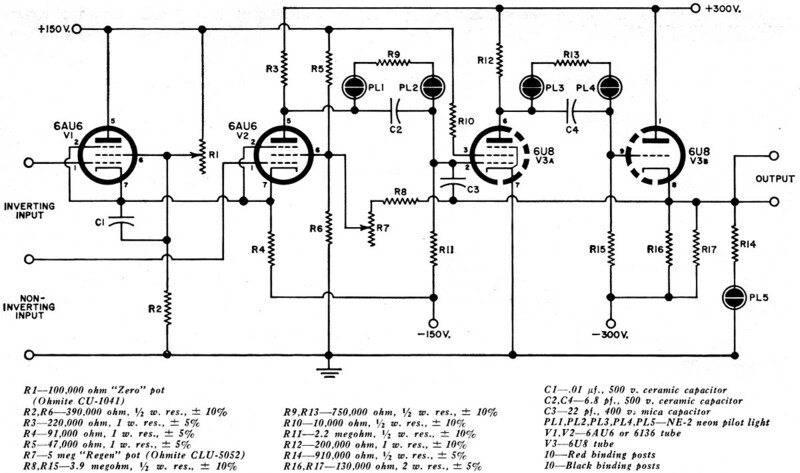 The circuit is useful for driving audio power amplifiers. It could provide a balanced low-impedance output for a single-ended audio generator, or it could drive the deflection plates of an oscilloscope which has no d.c. amplifier. Fig. 1C is an extremely well-regulated electronic power supply which furnishes plus and minus 15 volts at 4 ma. each for experimental transistor circuits. The first amplifier amplifies the -150·volt reference source by - (1/10) to provide +15 volts. 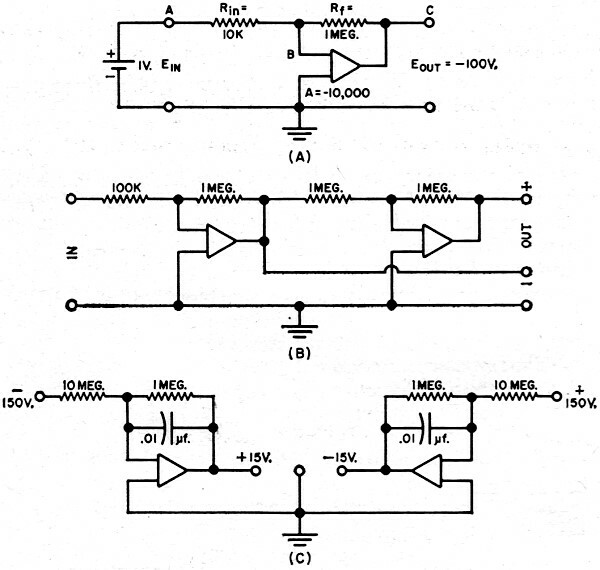 The second amplifier amplifies the +150·volt reference source by -(1/10) to provide -15 volts. The two capacitors provide a.c. feedback which is employed in order to give the circuit a very low output impedance. Fig. 3. Schematic diagram of one of two identical operational amplifiers that are employed in the author's design. After much planning and experimenting, it was decided to design and construct two operational amplifiers within a single housing, their power supply, a 6BJ7 triple diode for auxiliary functions requiring diodes, and plus and minus 1.50-volt reference voltages. Two amplifiers are far more useful than one, but three would have complicated the power-supply requirements and made the unit quite costly. The requirements of an operational amplifier are that with the inputs grounded, the output should be at zero volts d.c. with respect to ground; that the gain be quite high; and that the output impedance without feedback be fairly low. In addition, the unit must be direct coupled and its open-loop gain must be rolled off to less than unity before unwanted amplifier phase shift reaches 180 degrees. These last two requirements make it possible to use any amount of feedback without danger of oscillation. Another requirement is that d.c. drift be quite low. 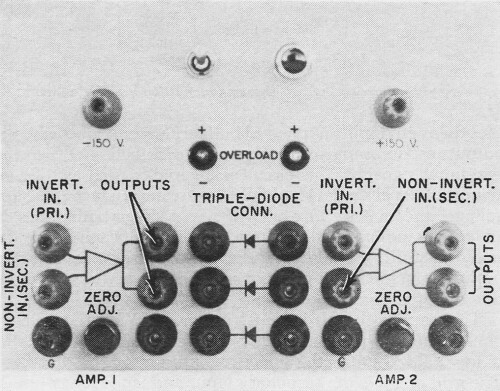 The following discussion of amplifier No.1 (see Fig. 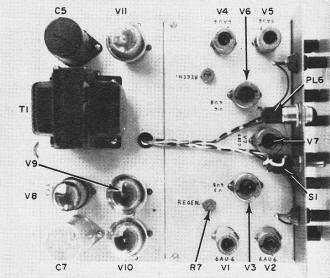 3), composed of V1, V2, and V3, also applies to amplifier No.2 which is identical. In the circuit, V1 and V2 comprise a differential amplifier. 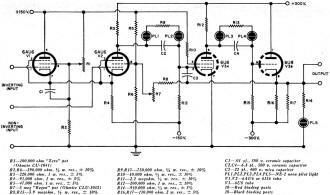 (Such an amplifier consists of a cathode-coupled pair with output taken at the second stage. It takes its name from the fact that with inputs applied to both grids simultaneously, the output responds approximately to the difference between the two input signals.) This circuit is invariably used as the first stage of an operational amplifier because any change in heater voltage, the major cause of drift, will affect both tubes in an equal and opposite fashion, tending to cancel out the effect of drift. In addition, the existence of a differential input permits many applications of the unit which would not otherwise be possible. Front-panel view showing all interconnecting binding posts. The amplifier has two inputs. The grid of V1 is the primary input. There is phase inversion between this input and the output. This input is the upper one used in all the diagrams. The grid of V2 is the secondary input and is the lower one in the drawings. There is no phase inversion between this input and the output. V2 could have been coupled to V3A by means of a 2.2-megohm resistor from V2 plate to V3A grid, and then another 2.2-megohm resistor from this grid to -150 volts. However, this would have resulted in 6-db attenuation of the signal. A better way is the use of neon lamps. Neon lamps work much like gas regulator tubes; that is, the d.c. voltage drop across them remains nearly constant with a fairly wide variation of current flow through them. The plate voltage of V2 is about +160 volts. This is dropped 55 volts by PL1, 50 volts by R9, and 55 volts by PL2. Any amplified signal at the V2 plate will be coupled without loss by PL1 and PL2 and will be attenuated only slightly by R9. R11 provides the current to keep the lamps lit, about 70 μa. R1 is the amplifier zero-adjust control. By varying the screen voltage of V1, R1 adjusts the d.c. operating point of the amplifier and is used to set the amplifier output to zero volts d.c. with both inputs grounded. V3A is a d.c. amplifier with a gain of -200. R10 limits the screen current of this tube to a value safe for the tube under amplifier overload conditions. 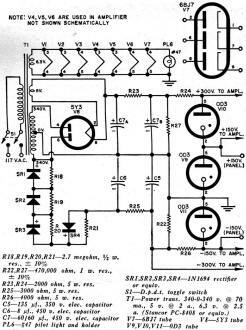 This stage drives cathode-follower V3B which has an output impedance of about 400 ohms. The neon light at the output terminal glows when the output goes plus or minus 70 volts and indicates an overload. Fig. 4. 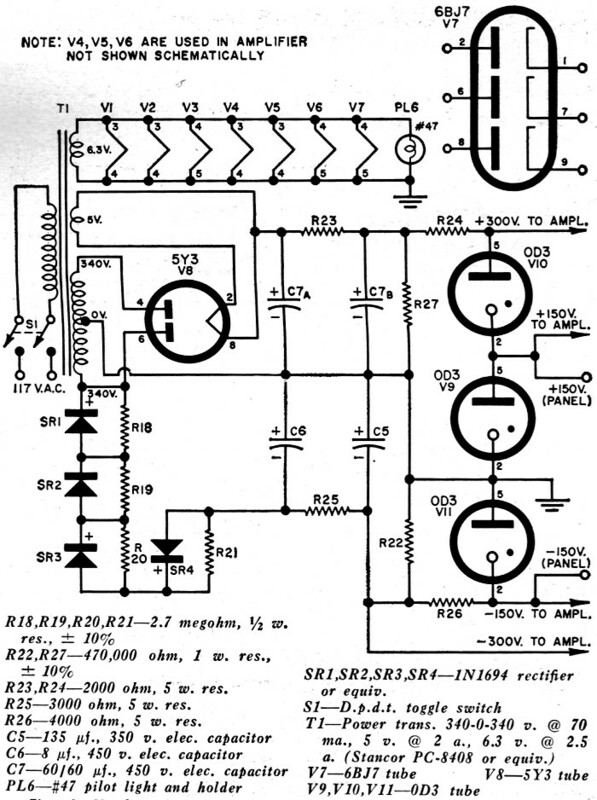 Single power supply used for both operational amplifiers. R7 and R8 are connected from the output to the screen of V2 and provide positive feedback to increase the amplifier gain from about 15,000 to a value approaching infinity at d.c. C3 provides negative feedback in V3A at frequencies above d.c. and is used to reduce amplifier gain, at a rate of 6 db per octave, to less than unity before a total of 180 degrees additional phase shift in both stages takes place. As this capacitor is for all practical purposes connected from plate to grid instead of plate to ground its effective capacity is multiplied by the gain of the stage. Its value was selected by trial and error and is just large enough to give the amplifier a damping factor of 0.5 to a square-wave input. 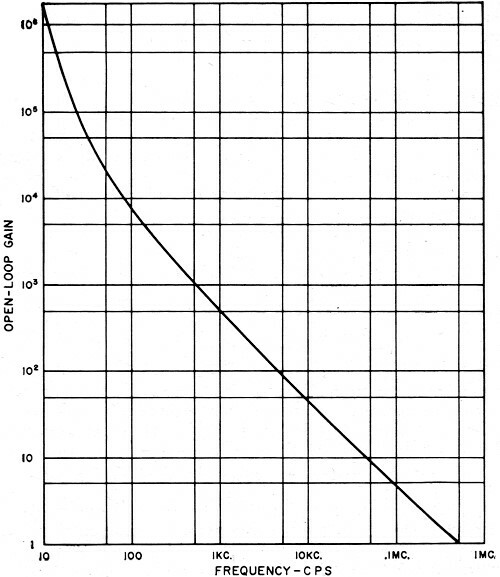 A plot of amplifier gain versus frequency is shown in Fig. 2. This plot is close to the idealized curve for operational amplifiers. The amplifier requires regulated d.c. voltages to prevent drift. The power supply is a conventional gas-tube shunt-regulated type. Its outputs are +150 volts, +300 volts, and -150 volts, all regulated, and -300 volts unregulated (Fig. 4). The unit is constructed on two 9 1/2" x 5" X 3" aluminum chassis bolted together with the power supply in the rear and the two amplifiers and the 6BJ7 triple diode in front. This two-chassis arrangement provides excellent shielding from 60-cycle hum. C5 and C7 are can-type electrolytic capacitors. The can of C5 must be insulated from ground and should be covered with electrical tape to prevent accidental shock to the user. Most of the amplifier components are mounted on a terminal board. Although the zero-adjust potentiometers are on the front panel, they could very well have been mounted on the chassis surface and have been of the screwdriver-adjust type as they rarely have to be touched. All of the amplifier input and output terminals, the triple-diode terminals, and the plus and minus 150-volt reference terminals are brought to the front panel on three-way binding posts. It is on these binding posts that the external feedback components and other external circuitry components are mounted during use. The black binding posts under the amplifier output terminals are unused. Top view showing the two-chassis construction used by author. Fig. 5. (A) Connections used to check for reduced line-voltage operation. (B) Setup to check for distortion less unity gain. The "on-off" switch, pilot light, and overload indicator neons are also on the front panel. The neon lights are inserted in 1/4" grommets and secured with rubber cement. They should be mounted with one terminal directly above the other. The upper terminal is grounded and the lower terminal is connected through the 910,000-ohm resistor to the amplifier output. When the upper electrode glows, a positive overload is indicated and when the lower electrode glows a negative overload is indicated. After the front panel is cut, drilled, and punched and before it is mounted, it should be sprayed with gray paint. Then all of the symbols are marked on it with India ink and a final coat of clear acrylic spray is applied to secure the India ink markings. The rest of the construction details are obvious from the photos. After the unit is completed and the wiring checked for errors, it may be tested as follows. First insert all power-supply tubes and turn the unit on. All three regulator tubes should light. Then plug in the three tubes of amplifier No.1 and ground the two inputs. After a minute's warm up, it should be possible to balance the amplifier. Set R7 to maximum resistance. Turn the zero-adjust control, R1, slowly from one extreme to the other. At some point the overload indicator will change from a positive indication to a negative indication. The point where this change takes place is the correct setting. If this condition cannot be met, the two 6AU6 tubes are probably not sufficiently well matched for this application. Try substituting other 6AU6 tubes until a pair is found that will permit balancing. Then connect the amplifier as shown in Fig. 5A. Offset the zero-adjust control sufficiently to cause a mid-scale reading on the voltmeter. Note this reading. Then decrease the line voltage by 10 per-cent by switching a 25-ohm, 5-watt resistor in series with the power line. The voltmeter reading will slowly change to some new value as the tube heaters cool off. This change in the voltmeter reading should be less than one-half of a volt. If it is greater than half a volt, try different 6AU6 tubes until a sufficiently well matched pair is found to meet this specification. Then restore line voltage to normal. 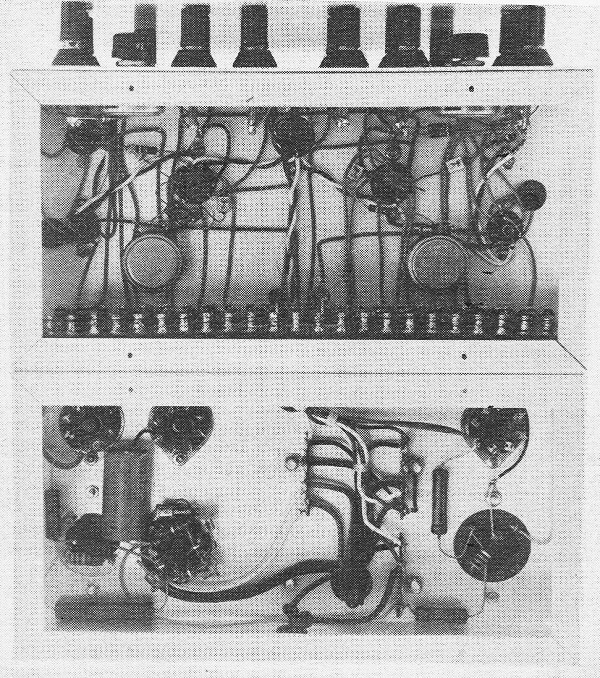 Bottom-chassis view of amplifier. Note use of terminal board. To set the regeneration potentiometer, R7, connect the amplifier as shown in Fig. 5A, only with Rf = 10 megohms and Rin = 100 ohms. Use a direct-coupled oscilloscope instead of the meter. Slowly turn the zero-adjust control back and forth to cause the amplifier output to go into its upper and lower limits, and steadily decrease the resistance of the regeneration potentiometer R7. The zero-adjust control will get more and more sensitive. Soon a point will be reached where the amplifier output suddenly switches from one voltage to another and cannot be set to any value in between. Back off the regeneration potentiometer slightly from this position. This is now the correct setting. Next connect the amplifier as shown in Fig. 5B. The amplifier should provide unity gain to the signal coming from the audio generator and the output should be free from any distortion or parasitic oscillations from the lowest possible frequency to 100 kc. Repeat all the previous test procedures for amplifier No.2 and plug in the 6BJ7 tube. When tests are completed the unit is ready for use. Next month, some sophisticated uses of the operational amplifier unit will be presented, including a voltmeter calibrator, frequency-sensitive feedback circuits, oscillators, a capacitance bridge, multi vibrators, and others.